Every vacation town we've ever visited has had at least one great candy shop. It's always crazy busy (at least in summer) and there's a huge selection of lollipops, jelly beans and every kind of chocolate bonbon. But the ones I want...um...OK, let's be clear that I really want everything, but the ones I buy are big chocolate covered marshmallows and chocolate truffles with creamy centers. 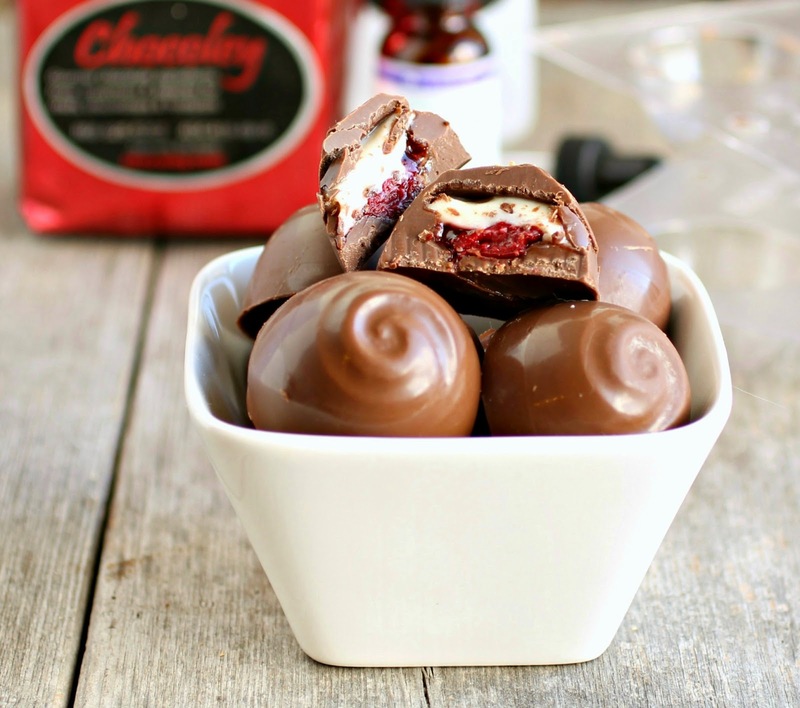 I had no idea how to recreate the truffles at home but I figured I could make the chocolate covered marshmallows. Big fail. And after a couple of sad attempts I gave up. Then, recently, I happened on a web site called Chocoley and found myself completely engrossed. They sell all the supplies to make candies and have a couple of very impressive features. Tempering chocolate is a huge mystery that I had no desire to solve but Chocoley offers the option of chocolate that needs no tempering. They also basically ask you what you want to make and then direct you to those products that will help you make it. Big thumbs up. More amazing still was that after I was already a fan of the company's web site, they offered me the opportunity to work with some of their products. Big, big happy! I placed my order and began playing mad candy scientist as soon as it arrived. My box of goodies came with instructions and tips on how to best work with the products I chose and I produced my first ever truffle in record time. I chose one of the larger bonbon molds because I thought it would be easier for a beginner and it was. Even though there are a few steps involved in truffle making, each is easy and the chocolate sets up quickly in the refrigerator. I knew I wanted to make a cherry cheesecake filling but that didn't stop me from also stuffing the molds with nuts, marshmallows, peanut butter...um, you get the idea. I was a total kid in a candy store. And all those fillings were great but the cherry cheesecake is the bomb. It came out every bit as good as I'd hoped and is worthy of being sold at any of those fancy candy stores. Now I have to go speak to the Chocoley people because I definitely need more supplies. Enjoy! Melt the chocolate in a double boiler (just place a bowl over a pot of simmering water), stirring frequently. Do not allow any water or condensation to get into the chocolate or it will seize. Pour about a tablespoon of the melted chocolate into each cup in your truffle mold and roll the sheet around so that the sides are coated. Lightly tap the mold on the counter and place in the refrigerator for about 15 minutes. Combine the cream cheese, sugar, cheesecake flavoring and salt and mix until smooth. Note that the cheesecake flavoring is optional but I found that it gave the filling that baked cheesecake flavor that I didn't get just from sweetened cream cheese. 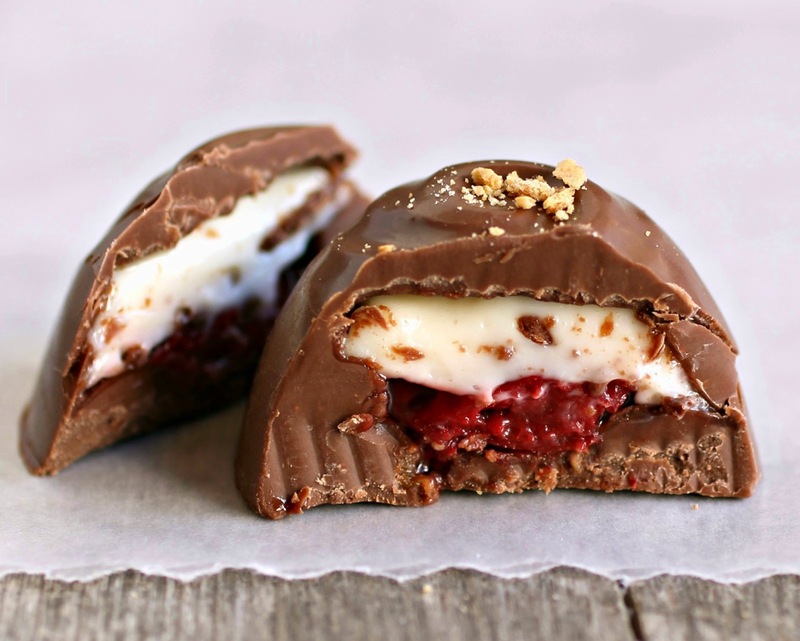 Place about a teaspoon of cream cheese filling into each chocolate cup, place a cherry on top and add some crumbled graham cracker pieces. Pour another tablespoon of chocolate over the top, making sure not to go over the sides of the mold. Tap lightly on the counter and return to the refrigerator for about 30 minutes. To unmold the truffles, simply turn the mold upside down on the counter. If a light tap doesn't cause the chocolates to pop out, return it to the fridge for another few minutes and try again. When it's thoroughly cooled and set, the truffles pop out very easily. Note: Chocoley provided me with supplies but I was not otherwise compensated and under no obligation to provide a positive review. I genuinely enjoyed working with these products and highly recommend them. 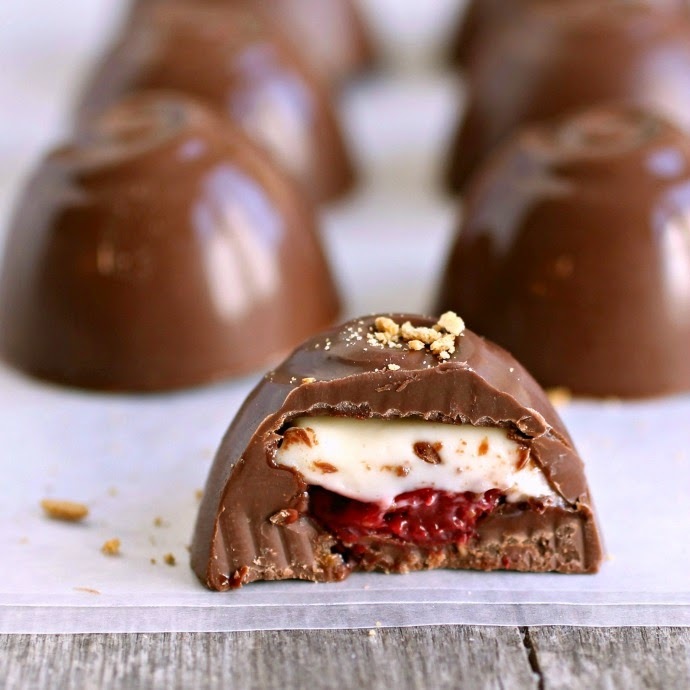 Nommm... cheesecake truffles! These just sound so delicious! Beautifully done. Those look pretty easy to make, Anita! I can't wait to see all the combinations you come up with. Cherry cheesecake looks wonderful! This is something my dad would have loved. One of his favorite treats was chocolate covered cherries and these definitely beat out any of those sold in a box. Anita, you are so talented. This is one wicked delicious combo!